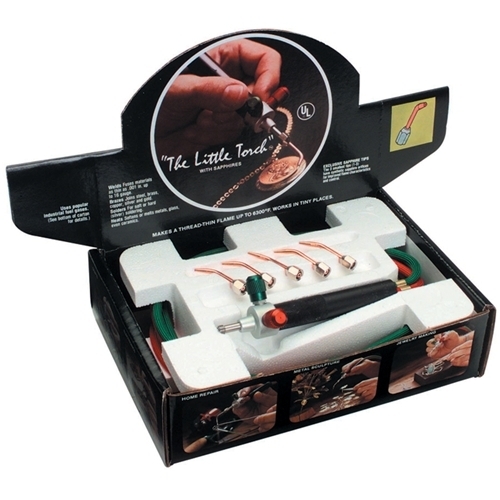 The Little Torch welds with incredible precision an unlimited range of materials from less than 0.001" copper wire to 16-gauge steel with many fuels including propane, acetylene, natural gas and more. It brazes the tiniest elements with uncanny accuracy. It solders hard or soft materials. Whether your material is metal, plastic, glass or even ceramic, Little Torch does the job quickly and easily. Its rugged aluminum alloy body weighs only 0.5 oz. and is superbly balanced to allow the operator to maneuver easily in areas impossible to enter with a conventional tool. The pencil style handle makes it easy to direct the flame exactly where you want it for a cleaner, more professional job. It features a thin, extremely lightweight hose that gives it added flexibility. Little Torch heats with infinite control at an infinite variety of settings and sizes. Produce thread-thin flames up to 6,300°F. Can be used with many fuels, including acetylene, hydrogen, propane, propylene, MAPP, LP and natural gas. 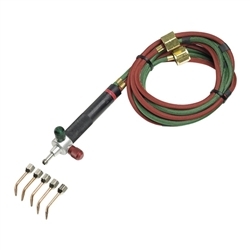 Each Little Torch Starter Set includes one torch handpiece, 8' oxygen and 8' fuel gas twin hose with 9/16" connectors and five brazing tips (#3 to #7). Additional, more comprehensive, sets are available. Great, necessary tool. Very light but definitely not flimsy. Changeable tips are great, from a tiny pen tip to a brazing flame this kit is great. Will recommend to anyone with tank set already.